Acer's Aspire U Series all-in-one PC is designed to run Windows 8 and, as such, features a huge 27in capacitive touchscreen. It's a good looking machine with a strong and easy to adjust stand, and it has a decent array of ports. Performance supplied from notebook-calibre components is good enough to allow this PC to be used for most office-type work, multimedia tasks and some gaming. Neatness and convenience are perhaps the best features of all-in-one PCs, which don't require much effort to set up and use, and they can be placed in relatively small abodes and offices — even big 27in models such as this Acer Aspire U Series (7600U). 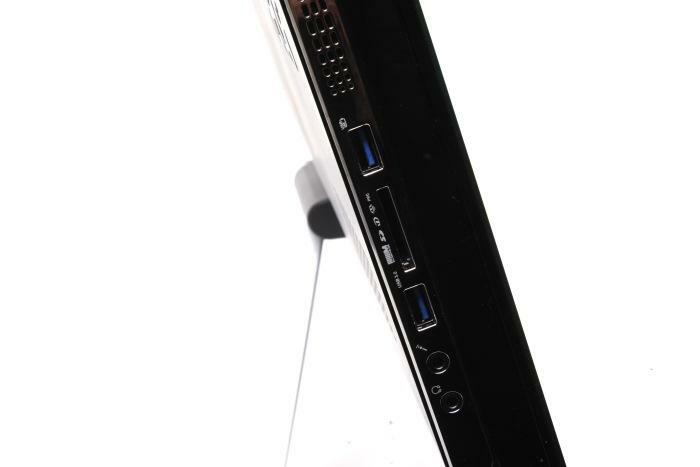 This all-in-one PC also possesses a more modern style than other all-in-one computers, thanks to its use of acrylic, a thin profile and an L-shaped stand. It's a model that supports 10-input capacitive touch and it runs Windows 8 so you can navigate the Start screen without moving your mouse or pressing any keys. What immediately sets apart the Aspire U Series all-in-one is a design that makes it look like it's floating thanks to its clear acrylic base, which has a rubbery material along its edge to make the unit stick to the table. At first we questioned the stability of this design, fearing it would slip, but held its ground perfectly during our test period. A drawback of the see-through acrylic is that you can see any cables that you plug in to the rear of the unit (such as Ethernet) and, of course, the stand. The stand that allows the Aspire U Series to tilt is a one-piece bar in the form of a slanted L shape, and it performs three very important tasks. Firstly, the very end of the stand houses the port that the power supply plugs into, making that cable easy to access and easy to manage. Secondly, the stand allows the PC to tilt back and forth with very little effort (see the video below). 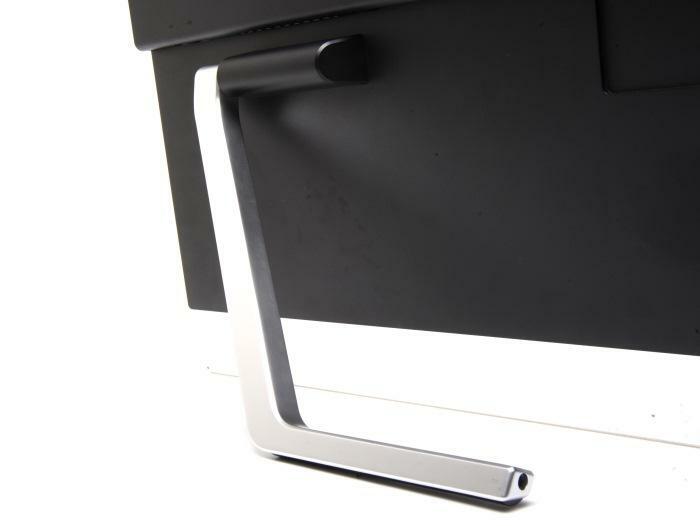 Thirdly, despite being so easy to tilt — you can use one hand to do so — the stand keeps the PC firmly in place on the desk. Using a PC with a touchscreen has always been awkward and there hasn't really been much need for touch in the past, except for kiosk-like installs and running custom software. But with Windows 8, a mixture of touch, the mouse and the keyboard are needed to get the most out of the operating system. This means you have to sit fairly close to the 27in screen in order to drag your finger across the screen and hit the Live Tiles. It's perhaps not entirely practical to use the touchscreen for more than just navigating the Start screen and hitting tiles to launch apps or access files, but it does depend on your needs. You might, for example, want to use the screen to paint a picture or play a game; you might not want to use it to browse the Web and scroll Web pages though. We found the capacitive touchscreen to be mostly accurate and responsive during our tests. New gestures for bringing up the Charms and flicking between apps and the Desktop in Windows 8 worked very well. We only had some slight trouble hitting smaller targets on the Full HD screen, such as the minimise button in the corner of Windows (mostly due to user error in hitting the target perfectly), but that's not primarily why the touchscreen is there — you'll still need to use the mouse and keyboard for most Desktop navigation. Playing around with the Start screen and new-style (Modern UI) Windows 8 apps was fun for the most part. Because the screen is so large, it can sometimes be difficult to perform long gestures such as closing apps by swiping from the top to the bottom of the screen. Friction can be an uncomfortable problem over such long distances on the screen. You'll want to keep the screen clean, using the supplied micro fibre cloth, and because it's a glossy screen, reflections will be a problem. You'll need to try and manage these by tilting and turning the machine so that light sources aren't directly behind you. It's a screen that possesses great viewing angles though, so pictures and video can end up looking great on it. In addition to the touchscreen, keyboard and mouse, the Aspire U Series offers gesture control through its webcam and a pre-installed Acer utility called PointGrab. With this software, you can sit in front of the screen and wave your arm from left to right to switch between applications, or you can wave your arm from right to left to bring up charms. You can also move the pointer around the screen (the pointer turns into a hand) and 'click' things with your hand, but it is not an easy thing to do. It's very much a novelty function rather than something that can be used in a practical way. Speakers are stealthily built in to the system, but the sound from them is not as amazing as the product documentation would have you believe. By default, a surround sound effect is enabled, which makes music sound far different from how it's meant to sound. It can be disabled. Overall though, the sound from the speakers is average at best and you'd be better served by a pair of headphones or external speakers. You could also plug in to a receiver using the S/PDIF port. The ports and slots are located along the sides and at the rear of the unit, and you have quite a few options at your disposal. The left side has two USB 3.0 ports, an SD card slot and headphone and microphone ports. The right side has the slot-loading DVD burner (DVDs are playable via third-party software that Acer says it will install on all Windows 8 systems), while the rear lip of the unit has four USB 2.0 ports, Gigabit Ethernet, S/PDIF optical audio output and three HDMI ports. One HDMI port is an output so that you can use the all-in-one with a second monitor or a TV, and the other two are inputs so that you can plug in external device and use the all-in-one's monitor as a display device — this even works when the PC is powered down. Dual-band, 802.11n Wi-Fi is built in (it's an Atheros AR5BW222 module), as is Bluetooth. Some models will even have NFC. The ports on the left side. The ports on the rear. The power port on the end of the stand. All the ports are located in the top-rear portion of the machine, which is a little thicker than the bottom half of the screen in order to accommodate the motherboard. Notebook technology has been used in order to make the Aspire U Series thin. The CPU is an Intel Core i5-3210M model, which is a third generation CPU that runs at a speed of 2.5GHz. It has two cores and Hyper-Threading, so it's fast for everyday tasks and useful for multitasking. It's accompanied by 8GB of DDR3 SDRAM, a 1TB hard drive and an NVIDIA GeForce GT 640M graphics adapter. Overall performance in our tests was swift. A time of 41sec was recorded in the Blender 3D rendering test, 53sec in the iTunes MP3 encoding test and 46min in the AutoGordianKnot DVD-to-Xvid file conversion test. All of these are solid results and the DVD-to-Xvid conversion time is especially encouraging if you want to use this PC for tougher-than-usual tasks. While the machine is running, its fan will make some noticeable noise, but we didn't find it to be too distracting in our environment. Graphics performance from the mobile NVIDIA graphics chip was solid as well, recording 10386 in 3DMark06. You'll be able to play games on this all-in-one PC, but some won't play smoothly at the native 1920x1080-pixel resolution of the screen. You'll have to play at more modest resolutions and graphics detail levels in order to maintain a playable frame rate. In the storage department, the 1TB hard drive identifies itself as a Seagate ST1000LM024 HN-M101MBB model in the Windows 8 Device Manager, with the second half of that being a reference to the Samsung SpinPoint HN-M101MBB (Seagate bought Samsung's hard drive business). This is a 2.5in notebook hard drive with a spin speed of 5400rpm and a SATA II interface. It's not the fastest drive we've ever seen, recording 33.65 megabytes per second (MBps) in our file duplication tests and 108MBps in both the CrystalDiskMark read and write tests. A configuration with an SSD (and a Core i7 CPU) is available if you want more speed. Boot-up time for the Aspire U 7600 was 20 seconds, and this is the time that it took the PC to go from its off state to the Windows 8 Start screen and the point at which we could control the system to launch an app. Power consumption while the PC was under a full processing load was measured as being 70W, while standby power was 1.5W. The power button is capacitive and not that easy to locate on the frame. Acer has placed lights next to it that light up in a row towards the direction of the button so that you can easily find it. This adds about 0.2W to the standby time. The price of the Aspire U 7600 isn't too enticing. However, you are getting a capable machine with notebook-level performance and discrete graphics that's packaged nicely behind a 27in capacitive touchscreen. It can be a productivity machine, it can be used for a little bit of gaming, and it also makes a great media consumption device. Indeed, the touchscreen is beautiful and it can be used not only for the computer, but also as a TV via the built-in dual digital tuner (it ships with a remote, too and it uses third-party TV software); external HDMI devices such as consoles or media players can be plugged to use it independently of the PC portion of the device. All this makes the Aspire U 7600 a rather versatile machine. If you have reservations about using Windows 8, Acer supplies a guide with the machine so that you can quickly learn all the gestures of the new system. You can also check out our beginner's guide to Windows 8.